Isolde Lübbeke attributed this panel to an anonymous artist close to the studio of Lucas Cranach the Elder. It depicts a standing woman, her figure perfectly adapted to the long, narrow shape of the panel and contrasting with the green background (which has darkened over the years). The inscription at the upper left corner includes the sitter’s age and the date of the painting but her identity remains unknown, although the rings on her left hand suggest that she belonged to a burgher family. The choice of colours for the clothes create a lively contrast with the background: the skirt and sleeves are red, the bodice is black, and the white of the areas near her face increase its luminosity. The head and face are extremely delicately painted, as are this young woman’s eyes, which look to the left and reflect a light that enters from outside the pictorial space. This portrait entered the Collection two years after the Munich exhibition that brought this important private collection to the attention of the wider public. 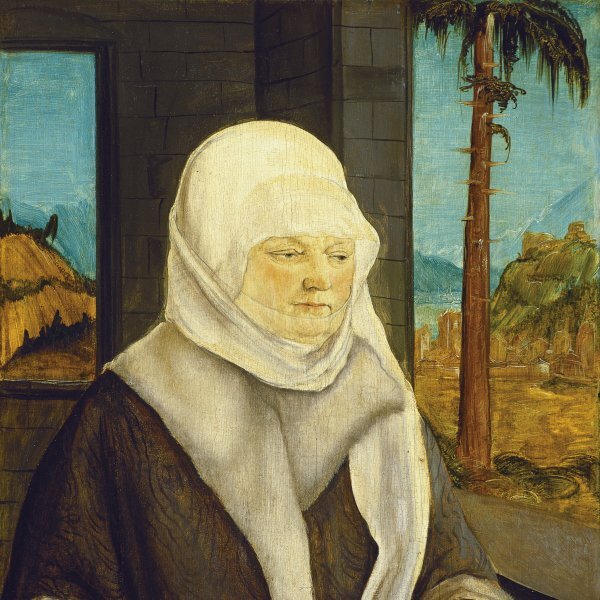 Regarding its provenance it is only known that it was with the Fleischmann gallery in Munich in 1930 and that it was included in an exhibition held at that gallery on the German Renaissance portrait, catalogued as by an anonymous German artist. The following year Friedlander attributed it to Lucas Cranach the Elder but published it in his text jointly written with Rosenberg as by the Master of the Mass of Saint Gregory. It appeared with this attribution in the catalogues of the Collection of 1937, 1958 and 1969, the latter entry written by Christian Salm. In the 1971 edition of the catalogue Salm modified his attribution and gave the panel to the circle of an artist close to the school of Cranach the Elder. 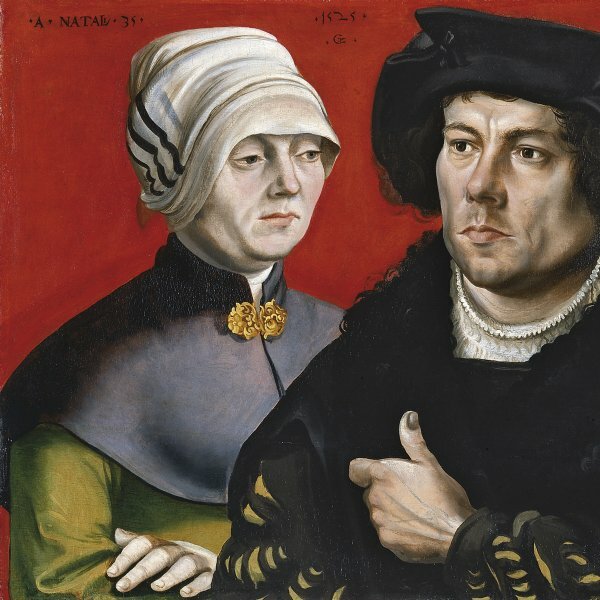 More recently the panel has adhered to Lübbeke’s attribution, who proposed an anonymous artist familiar with the methods and style of Lucas Cranach. Against a striking, dark green background the artist locates a standing woman, depicted half-length with her hands touching the bottom edge of the panel. Depicted in more than three-quarter profile, she looks fixedly to the left from where the light falls. The artist provides information on the sitter in the prominent inscription on the left, including her age and the date of the work. Both the sitter’s clothing and the numerous rings on her left hand indicate that she was probably from the patrician or bourgeois class. Adapting the long, narrow panel to the woman’s elegant and slender form, the artist offers a careful study in colours. Over the now darkened background he used a red for the lower half of the figure, applied in large areas such as the sleeves and skirt. The red is counterbalanced by the black of the bodice above it, while white is used for the areas closest to the face such as the headdress framing the face and the neck of the blouse around the throat. Her head is softly modelled in a pale, clear tonality with particular care in the depiction of the eyes, which have highlights reflecting the light source that falls from outside the picture space. 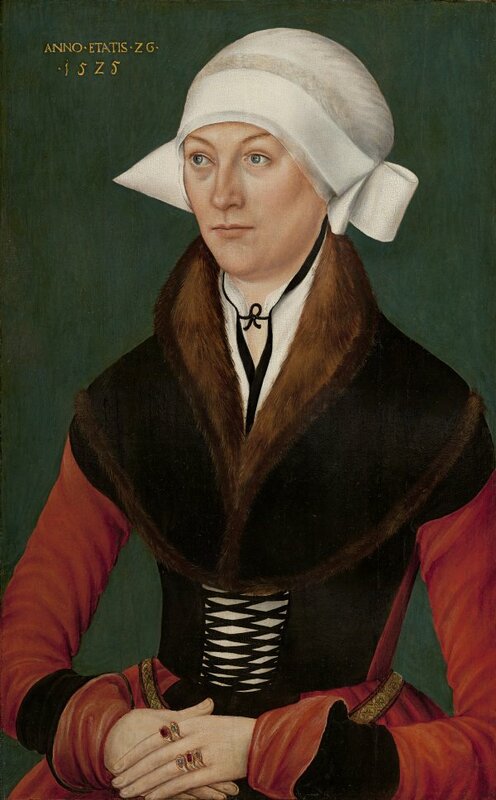 This detail, as Lübbeke noted, is found in a group of portraits close to Cranach. The author noted that this so far unidentified painter, working in a style close to Cranach’s and who has been associated with a group of portraits, is not the same figure as the Master of the Mass of Saint Gregory whose compositions, faces and decorative details are more restrained. A portrait of a woman in the National Galleries of Scotland has also been associated with the creator of the present panel.